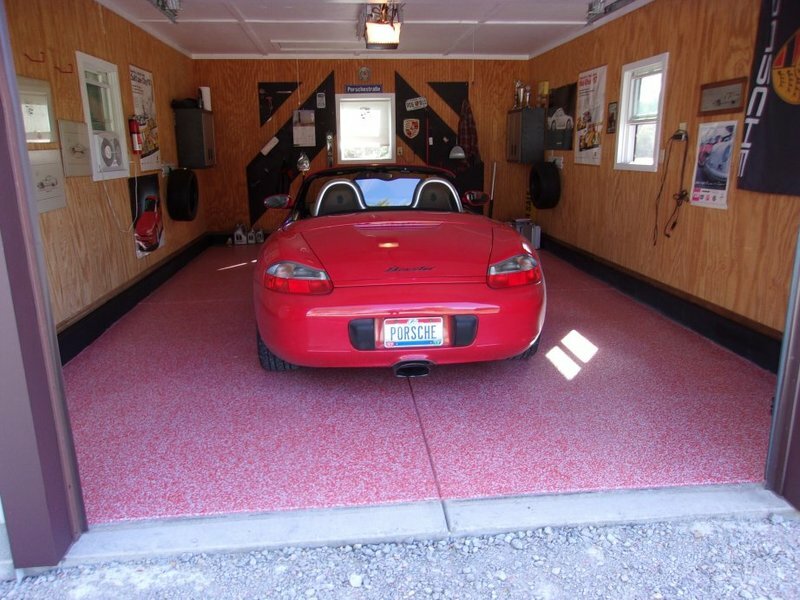 I built the garage ten years ago and have fussed since about what to do with the floor. I considered paint, snap tiles, vinyl tile, do it yourself epoxy, etc, etc. After talking to a couple of folks who have done a Gorilla Garage I decided to take the plunge. No, I'm not a salesman, just a Porsche owner who's happy with his decision. Hope you guys like the new look. Nicely finished with lots of room to work... or just bench race. I’d love a dedicated garage, as I have to share mine with the rest of the fam. 2002 Boxster S Tiptronic. Lapis Blue/Grey leather/upgraded Metropol top (glass rear window.) Still learning new things all the time about this awesome car! Well, darn. I should stop reading posts that inspire me to do....SOMETHING. My garage is about 4 yrs old, and a little over 900sf. When building, I wanted a lot for a garage (central heat + a/c), fully dry-walled, sealed insulated doors, floor drains, garage sink, ceiling fans, etc...but I never did anything with the floor. Like you, I have considered lots of options, but have yet to act. Would be very interested in your decision making process, and what lead you to this option, plus any install stories, regrets, etc. I looked at their site, and saw that the floor must be diamond ground...I assume this produced a horrid amount of dust? Also (since you did the research) what was the approximate cost breakdown of each option? As you can see, it's a small (10' by 24') single car garage. I built it with the specific intent of having a home for the Box. I had the cement work done by a local firm because I wanted it done right and I don't have those skills. The garage is ten years old. There were absolutely no cracks or other blemishes in the cement. Gorilla Garage came in and ground the cement which caused a moderate amount of dust. Their system collected most of the dust. They vacuumed and then put down the adhesive material and then spread the chips. The whole process is on their site. It was done by one guy in about six hours. I let it set for 48 hours before putting the Box back in. I'm really happy with the final product so far. The installer was great. He explained everything as he was doing the install. I looked at snap in tile, but despite the fact I don't drive the Box in the rain, it happens sometimes. I talked to some friends with those floors and they said even the "solid" snap in tiles get water under them and then a slime and mold builds up. I didn't think vinyl or paint would hold up. The last time I calculated snap in tiles it came it just over a thousand bucks. Now for the hard part, the Gorilla was just over $2,200 for my small garage. Hope this helps. GREAT looking garage! We've been looking to get our floor done, and your experience has provided some valuable information. It looks like the cost of your coating works out to almost $8.35 per sf, which seems a bit high. Did the installer offer any kind of warranty, say 10-20 years? Lifetime warranty for the original owner. Fifteen years upon transfer.